How much legroom will you find when you reach your airline seat? What's this aircraft "seat pitch" business all about? And how is it measured on board the plane? If you're a newly minted frequent flyer, or just need a refresher on what pitch is and how it works, we've got you covered. Seat pitch is a technical term used by airlines, and refers to the distance between the back of your seat and the back of the seat in front. 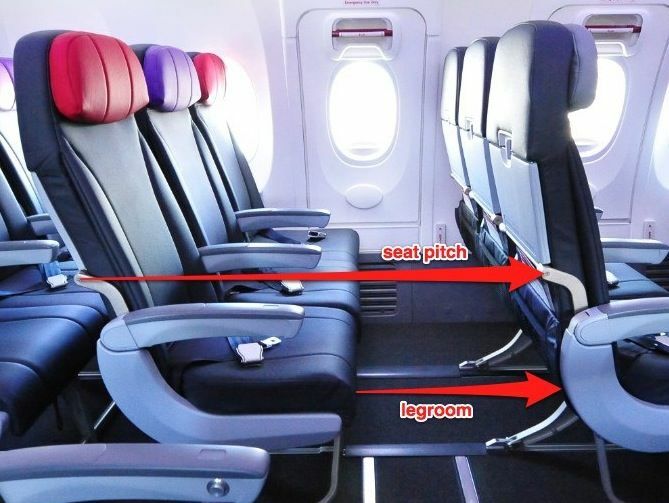 Pitch includes not also your legs but the depth of the seatback structure and cushions, plus the tray table. That exit row seat above has plenty of room, but if you're in a regular seat (have a peek at the row behind the exit row, for example) you'll have less space. What's the regular seat pitch in economy? That number is often used as a proxy for legroom -- but it's not really a direct equivalent since you need to take into account the depth of the seatback too. Some airlines sell seats with more legroom than that for an extra fee. On smaller planes like Boeing 737 or Airbus A320 jets, these might be the front row, a bulkhead or an emergency exit row. United Airlines also offers Economy Plus (a separate section of regular economy seats with more legroom in the economy cabin, heavily populated by frequent flyers), and Delta offers something similar in its Economy Comfort zone. A thicker seat -- especially in Economy, where there's less space to play with -- means that you get less legroom. You'll usually find these aboard older aircraft. Compare the thicker, older seat from a late 1999 plane to the seat from the brand new plane above. But it's not just the that newer seats are thinner. 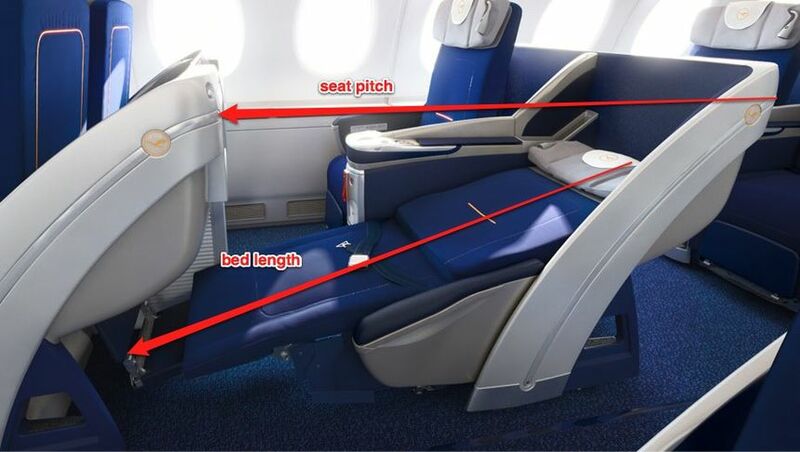 Some airlines are starting to use specially-designed slimline seats which move the seatback pocket up to eye level, have a different support structure and shave inches off even newer regular style seats. 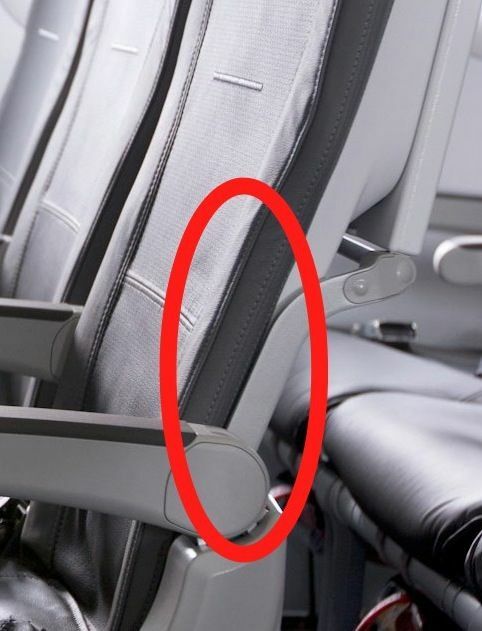 We tried slimline seats out recently in Germany, and were impressed -- although in fairness that's because Lufthansa decided to split the difference with passengers. 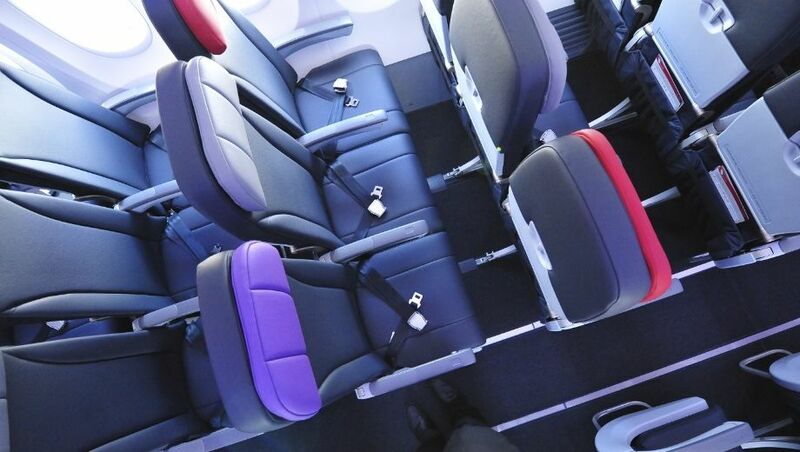 The airline gets more seats on the plane, and passengers get a bit more legroom. What about business and first class? In domestic business class or premium economy -- where the seats are recliners rather than the type that turn flat -- it's a similar situation. Measure seatback to seatback and that's your pitch. Within Australia, Virgin Australia has the biggest recliner pitch around, at just over 60" on its Coast-to-Coast Sydney-Perth A330 planes. As any geometry student could tell you, the length of the bed when sloped at an angle can be greater than the pitch of the seat horizontally. Pitch is still important at the pointy end of the plane, though: the more space there is in front of you, the easier it is for window passengers to nip out over a sleeping aisle passenger. All sorted? Any questions? Ask away in the comments section below or fire off a tweet to @AusBT. Is it a quiet news day John? Mate, you know we're not just a news site. We carefully craft our daily mix to make sure that there's a good variety of information for everyone. This kind of explanatory article is core to our reader offer -- and it's also useful to refer back to whenever we (or others) talk about pitch. John I thouht it was a great article. Good to read about all facets of the airline industry. This is certainly one of the important ones. I knew a bit about seat pitch but still managed to pickup a few things from your article I didn't know. I think it's very useful, most people wouldn't know what any of those terms meant. TheRealBabushka: lighten up dude. Not only is AusBT not just a 'news' site as John said, with lots of articles for general reference and information, but the guys were at Sydney Airport yesterday morning, Sunday, to cover the new QF A330 when most of us were in bed or having breakfast. I don't think you can then take a shot at them as if they're lazy! John: great article, everybody wonders over this stuff when they start flying, great to see it explained in plain language and with good photos too. I reckon TheRealBabuska as well as posters commenting on him are a bit harsh in their comments. Have to admit with TheRealBabuska that the seat picth article seems to be coming back / is reposted (with sometimes updates) quite a lot (together with the article on the difference between lie flat and fully flat seats in business). however, I guess if there is an audience who is not familiar with seatpitch (or business class seats for that matter) it is useful to pots it (again). The frequency that we create, revise and update articles like this is all part of the thinking we put into the daily mix, KG. Obviously, we try to spread that out at a reasonable pace so that our regular readers and expert flyers are getting their news fix, but equally there are many, many readers who aren't regular commenters or who are new to flying. I bet if you stopped five people on the street, maybe one of them might know something about seat pitch. In terms of specifics, this article was last reissued seven months ago as an update -- fleshing things out and casting a fresh eye over our explanations. The previous update was in November 2011. Honest question: is twice yearly annoying for frequent readers? I wouldn't want to speak for you, but is this one (and the one about lie flat vs fully flat) sticking in your mind because we link to it frequently when we talk about seats? I'm pretty unapologetic about that, mind -- one of the really great things about AusBT being online is that we can hyperlink instead of having to explain seat pitch in every article. AusBT is growing so fast and proving so popular that even people we think are regular commenters who've been around forever mightn't have seen articles like this when they were first written -- let alone new readers, people finding their way here by Google or being linked here by a friend or colleague. 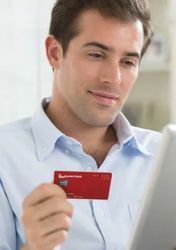 Hi John, I am not critising AUSBt at all and I understand that there are a lot of new joiners to the forum / new readers to the blog. For me it is pretty simple, if I already know a topic I just skip it (or perhaps glance over it to see if there are any updates in the article). Having said that (and maybe it is already part of the site refresh coming soon) it could be helpful to have a seperate directory on AUSBT which lists topics and has links to relevant post from the past. Esp on the seatpitch, lie flat / full flat, airline alliances, airline lounge topics (I am aware you kind of have his in the left hand menu when you click an article / on the bottom of the page) but I am talking more an "at a glance" or "Common airline lingo explained" section. Keep it up, again, not critising you at all, just observing, giving feedback. Hey, we're always up for constructive criticism and hearing what our readers think -- and really, thanks again for chipping in. One of the things on my to-do list even before the site refresh is to work together these kind of informative, definitions-based articles into a hub page -- like our Best Seats hub, for example. We're all about demystifying the often-murky world of airline lingo (Yes, that pax was nonrev SYDMEL in Y on a BSI 738! ), so that's definitely on our list too. Question for you and for other readers happening past: what else would you like demystified? What would you like to see next in "John Explains It All"? Constructive criticism is good...so is a spot of sardonic banter, I hope! Wasn't expecting such a kerfuffle from my comment! But, John what I'd really love to learn (and have analysed for me) is the application of EU regulations for airlines and its impact on carriers/pax within and without the EU. What are reach and limits of these regulations? Hope you would consider this topic. Love what you do. Thank you! Those Lufthansa business seats make me cringe... at least their food is half decent! 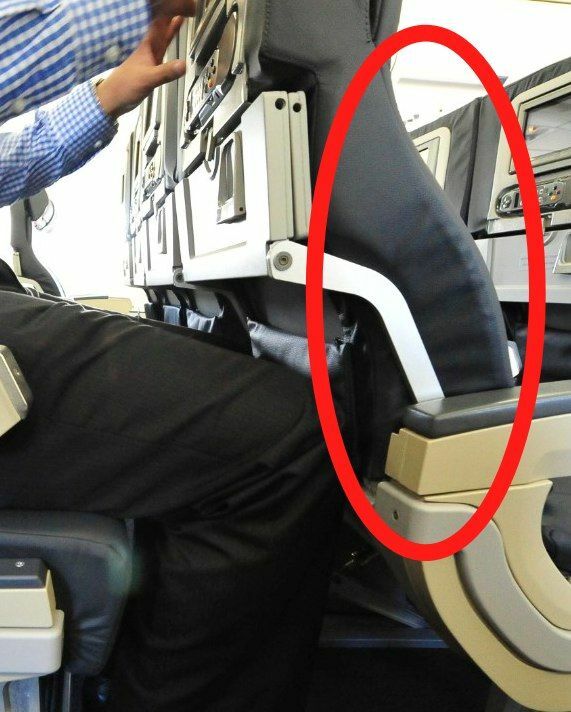 Comment on "Leg room, seat pitch & your 'personal space' on an aircraft explained"